Rear patio area and beer garden are very pleasant places to be. The presence of the Hampstead and Westminster Hockey Club on occasions is regrettable, as they behave like idiots, almost without exception.Yahoos one and all. Still, it's not too often (Thank God). Paddy and Eilish run a nice pub. London Pride and Young�s Special on. The Special was in excellent nick, and at �2.80 a pint not too expensive. No food though. It�s still a two-room pub, with what I guess would be regarded as the Saloon Bar furnished with sofas, and aspidistras on the window ledges. Quite quaint really, and very reminiscent of someone�s front room. The larger of the two bars is furnished with normal tables and chairs, and includes the fruit machine, large TV screen, and dart board. 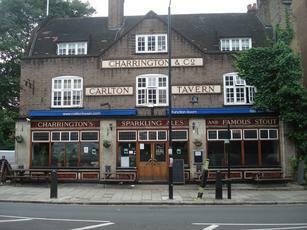 The exterior has what looks like the original Charrington�s signage, and the interior has somehow managed to retain its original inter-war features. 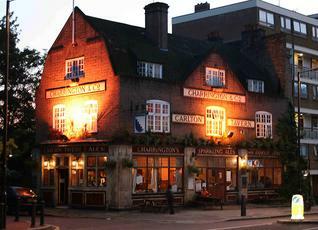 This is most definitely a locals� pub, but I nevertheless found it friendly and welcoming. The lady who served me � whom I took to be the landlady � seemed very happy to chat to me about the pub�s provenance, and clearly took pride in how the pub was perceived. This is most certainly the sort of real pub that I like. Highly recommended. n.b. that between September and April this place is used on a Saturday by a hockey club as their club house, so expect lots of kit bags, sweaty socks and drunks. However, as this may on occasion include me, I'll not say anything too bad about their behaviour. 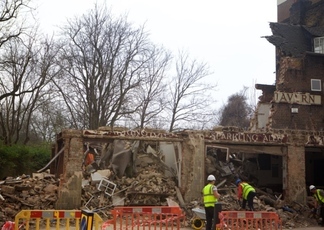 This pub has improved markedly since the new management took over last year. And, in view of its position on the "Kilburn Boarders" isn't as rough as it might be. However, saying that, unless you're a local I can't think of a reason to visit, and if you're just in the area the Warrington is a more interesting experience and better pub.